So good we bottled it. Get cooking, heating and even bathing with gas. Whether you're moving home (as in moving house, not living with your mum and dad, not that we’d judge, much) switching suppliers or simply need to arrange a refill. We make it easier than a very easy thing. Plus sign up for our ‘Power Package’ (get both Electricity & LPG) and you’ll enjoy double the energy and a great deal. Pay just $99 per bottle – saving you $16 per refill on the standard price of $115. Check out our plans and prices here. You can order immediately during sign up, otherwise, once signed up, you can order your gas bottles through our handy mobile App or register here for My Account, it takes just a few clicks. We also have this online form. Once your order is confirmed we will place your order with our delivery partner Genesis. 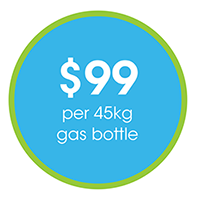 Genesis is a diversified energy company and we have partnered with them to deliver bottled gas to our customers all across New Zealand. A Genesis delivery truck will arrive at your home and provided your bottles are accessible, they will deliver your gas bottles as per your request. Your gas bottles will arrive on your next available scheduled delivery day from the date you place your order but we will always make an effort to get this out to you asap. After delivery, we will leave a card in your mailbox as a heads up that you’re all good to go. 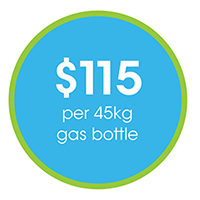 Please note if there are currently no 45kg LPG gas bottles connected at your service address, a gas fitter will be required to attend the site to connect your bottles after your delivery has taken place. If you currently have empty bottles connected, Energy Online will deliver and connect your replacement bottles however these will be left turned off. For your safety, please ensure all appliances which use gas are turned off prior to turning your new bottles on. If you want to know more about how your gas bottles works, when it's empty or when to order, click here. Please note if there are currently no gas bottles set-up or connected at your service address, a gas fitter will be required to attend the site to connect your bottles after your delivery has taken place. If you currently have empty bottles connected, Energy Online will deliver and connect your replacement bottles however these will be left turned off. For your safety, please ensure all appliances which use gas are turned off prior to turning your new bottles on. If it's safe, turn the tap off clockwise on the top of the bottles. If a leak is suspected from any appliance inside your home, ventilate the area by opening doors and windows. Leave electrical appliances as they are - don't turn them off or on. Vacate the premises and call Energy Online on 0800 086 400. If possible, call us from a neighbouring property as yours may be unsafe.